and 9 variants both classic and modern. Chess has a history that dates back to 6th century India. Its rules have evolved quite a bit since then. Modern chess enthusiasts have experimented with alternate setups, pieces, boards and rules. Each of the 9 variations included in Chess+More has a different strategy and poses a different challenge to the player. 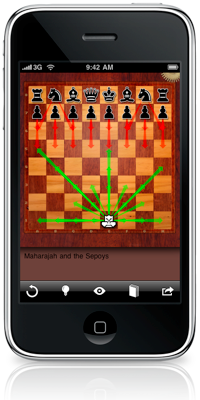 Chess masters can benefit from playing variants which allow them to explore areas of strategy rarely seen in normal play. Novices can learn the basics of how pieces move and strategy for strong play. Modern chess with FIDE rules. Strong computer AI with variable difficulty. Pass-and-play so you can play with your friends. Suggest-a-move with look ahead analysis. A unique visualization mode to help you see all possible moves. For help with Chess+More or to report bugs, please contact me directly.